ALAN Goh, 54, founder and managing director of Aleoca Pro Singapore, is unusually frank when asked about his 27,000 square foot warehouse and office at Pasir Panjang Distripark. He admits that his operations in Singapore, which stock the homegrown Aleoca brand of bicycles solely for the domestic market, have not been profitable for a few years. "If today I close (the) Singapore (operations), that will be much better for me; it's a burden," says Mr Goh. Rising business costs - largely from surging manpower and rental expenses - have resulted in this situation. But when asked if he may eventually shut down the Singapore office or relocate it elsewhere, Mr Goh replies with a very firm "No". And the reason, as he puts it, is patriotism mixed with a little bit of nostalgia. Singapore, after all, is where he started Aleoca, a manufacturer and designer of the humble two-wheeler, in 1996. Then 36 years old, Mr Goh had already spent 16 years of his career with IPS Brothers Enterprises, which later became the healthcare firm OTO Singapore. There, his chief executive Yip Chee Seng gave him many opportunities to learn, despite Mr Goh's lack of educational qualifications, having gone to school up to Secondary 1 only. Mr Goh tried his hand at various job functions and picked up many skills along the way, including sales and marketing, procurement, inventory management and setting up a regional office from scratch. But with a dream of wanting to "build the bicycle with the best value and that is affordable to everybody in Singapore", he wrote a business proposal and rallied a few investors to form Aleoca with about S$300,000- S$400,000 of initial funding. The company started by designing and developing its own brand of bicycles. Manufacturing was outsourced to Taiwan and the products imported to Singapore for sale at departmental stores. It was a bold concept then, considering that consumers were used to buying a bike from the heartland shops close to their homes so that they could easily take them back for repairs if there were problems. "Many people said my idea was crazy and they didn't think we were able to change the consumer-buying behaviour," recalls Mr Goh. "But I thought to myself, 'The bottomline is customer service - if they have a problem with the bike, how would they manage to service it? That is the only problem a consumer considers'." To overcome that problem, Aleoca put a sticker with its service centre hotline number on every bike. The deal is: any buyer who has a problem with the vehicle can call the hotline and someone will pick up the bike, repair and service it, and send it back - all for S$15 each way. "Many nights, I went to the customer's house to repair the bike... But I think if we please one customer, the statistics show, the customer will spread the word around about five to seven times." The initial period was tough. With no money to employ staff, his was practically a one-man show. He would meet buyers, set up sales locations and educate his distributors' sales staff in product knowledge. And when the cargo arrived, he would be at the warehouse before sunrise to unpack, stack and organise the goods. "The earliest time I reached home every day was midnight," he says. A breakthrough came in 1999 when the company started to receive original equipment manufacturer (OEM) orders from Japan and Italy. Although those products were not sold under the Aleoca brand, the move helped to build contacts in the bicycle industry and strengthen the company's design capabilities. About five years ago, sales of Aleoca branded bicycles began to surpass that from the company's OEM business. 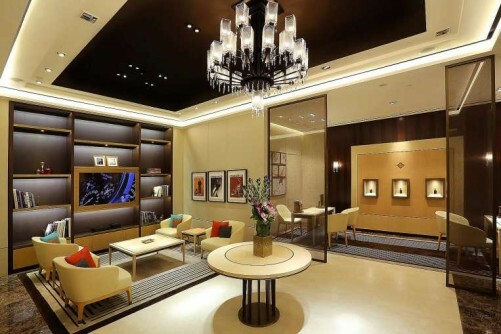 The company has also set up its own manufacturing plant in China's Guangdong province and developed enough capabilities to amass a small R&D team internally when a new project calls for it. 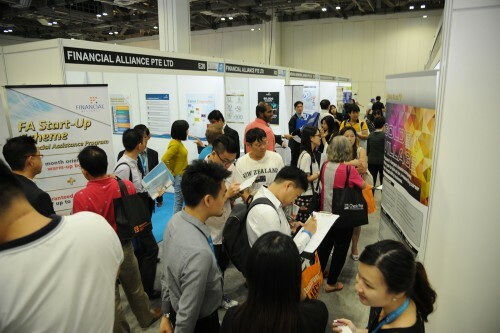 With a headcount of about 55, it posted annual revenue of S$17 million last year, with 70 per cent contributed by its proprietary brand and the rest by OEM sales. Aleoca-branded two-wheelers can be found in Malaysia, Vietnam, Philippines, Indonesia, China, Barbados, Colombia and Egypt. Last year, the company set up a 3,500 sq ft store-in- store space in Jakarta's Carrefour that it aims to clone in Singapore, Malaysia, Vietnam and the Philippines. But no matter how big the company grows, the intention is for Singapore to remain the nerve centre of the group. Says Mr Goh: "It's the HQ... the profit allocation is in Singapore, which means the Singapore (office) still commands the whole operation. We can have many business activities in China but the instruction must be from Singapore." Still, the world is always on his mind. As serendipity would have it, Mr Goh got to know fellow Singaporean Nicolas Leong, who founded Kenyan Riders, a professional cycling team in the African country. Inspired by the latter's vision to bring the first Black African team to the Tour de France, Mr Goh decided to have Aleoca pick up the sponsorship of the team. Working with the riders, Aleoca has started to build customised, carbon-fibre racing bicycles for each of them. It hopes the team will help to give the brand greater exposure and a push into the business of making personalised bikes. To gear up for overseas expansion, it has registered its trademark in the US, Europe and Asia. "We want to build this brand into an international one," says Mr Goh. "And we're not expensive. 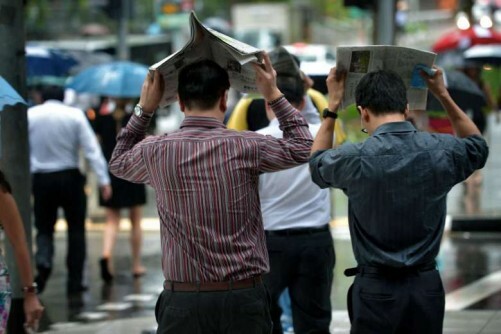 No need for S$10,000; no need for S$5,000." 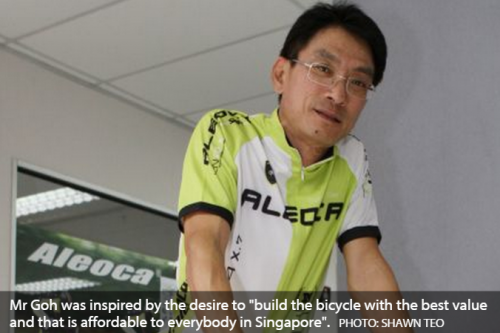 He estimates that an Aleoca custom-built bike may cost as low as S$2,300, depending on the components. A place in the Tour de France by the Kenyan Riders will help to launch the Aleoca brand in Europe. But Mr Goh is not in a hurry, preferring to help improve the riders' performance first. The team came in first in five races in Singapore, Malaysia, the Philippines, Indonesia and Kenya last year. Mr Goh says: "We've got to get multiple championships, then people will recognise them. I'm going to bring them to the US and then Latin America, win multiple championships. Then we can bring them to Europe. "That is the dream. But it could be five years, eight years - or maybe I do not get the chance to see it. But the mission has already been told to the next generation." Ever the patriot, Mr Goh has plans to sell S$50 foldable bikes in Singapore in conjunction with the nation's SG50 celebrations. Called The Little Red Dot, the bicycles are "flexible and adaptable, just like Singapore". Mr Goh says the bicycle - possibly the cheapest foldable bike Aleoca has retailed - is being offered at a subsidised rate. It is Aleoca's way of sharing the fruits of its labour with fellow Singaporeans, he says.